Built circa 1900, the Atlanta Spring and Bed Company--Block Candy Company is located in the industrial section northwest of downtown Atlanta. Representing early 20th-century industrial activity in the city, the building was constructed for William R. Ware, an Atlanta furniture manufacturer. The Atlanta Spring and Bed Company was the original occupant of the space from 1900 until 1909. After housing several businesses, the building was then occupied from 1928 until 1936 by the Block Candy Company, Atlanta's first confectionery manufacturer, started by the post-Civil War entrepreneur, Frank E. Block. 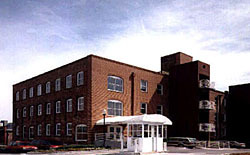 The four-story building is a significant example of the utilitarian industrial design used for large manufacturing facilities at the turn of the 20th century. Functional in design, the building features heavy timber post-and-beam construction and masonry load bearing walls with first floor granite walls and upper floor brick walls. Exterior features include segmental arched windows, recessed window bays, brick belt course, and a brick elevator tower. The interior includes the original fire doors, exposed mechanical systems with a historic sprinkler system and exposed wood posts and beams. On the first level, there are brick and granite walls and posts resting on brick piers capped with granite slabs. The second level or main floor has tongue-and-groove floors, brick walls, wood ceilings, and arched window and door openings. The upper levels feature the same elements, except for concrete floors. 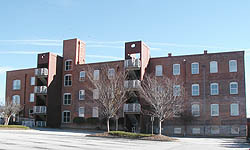 This building was once part of an industrial complex that included the Atlanta Buggy Company and Ware Hatcher Brothers Furniture Company buildings, as well as others that have been demolished. The industrial building was recently renovated as office space, retaining the exposed brick walls and timbers. The Atlanta Spring and Bed Company--Block Candy Company, 512 Means St., is used as office space. It is not open to the public, but the lobby serves as an art gallery displaying the work of local artists.